Petra Caravan also offers specific experiences for travelers who wish to arrange a camping program while they are in Jordan. This would be perfect for travelers who have made their booking with us and have a few extra days to add-on more great experiences. You can have a tour for a few hours or decide that you would like to continue touring with us. Stay as long as you wish! Day 1: In the early morning, we will visit Petra through the Siq and hike to the High Place of Sacrifice. We will visit the center of Petra and end the day camping near Little Petra. A Bedouin dinner will be prepared in the fire . Day 2: After breakfast and time permitting, we will visit the sites of Little Petra and Baidah. We will travel through the ledged path leading the back way into Petra to El Deir/ the Monastery and visit the sites Petra . Camp near the Snake Monument in Petra. Day 3: After breakfast, begin a minimum of a 2 hour hike to Jabaal Haroun (Mountain of Aaron). At the top, have a beautiful view of Petra and the Wadi Araba valley. Spend a second night camping at the Snake Monument in Petra. Day 4: We will trek down through the colorful Valley of Sabrah to the Forgotten Theater and the southern caravan station, concluding the camping trip. Included: Luggage transport, Guide (compulsory), Camping permit, Camping equipment (2-person tents, mattresses, cooking utensils), food, a cook (6 or more people). Excluded: personal insurance, tips, and entrance fees for Petra. 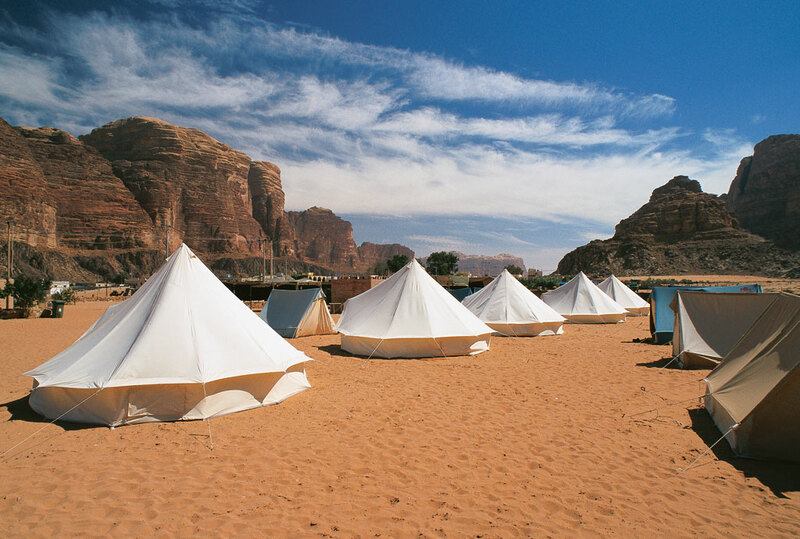 You can enjoy the silence of the desert in Wadi Rum, the evenings around the camp-fire, and the celestial sky above. Day 1: We will meet at the Wadi Rum Resthouse. Next we will transfer by 4x4 to the camp where we will have dinner and spend the evening camping in a Bedouin tent. You can choose to sleep in the tent or out in the open desert night, whichever your preference. Day 2: After breakfast, we will return to the Wadi Rum Resthouse and conclude the camping trip. Other Tour Themes and ideas: Family tours, Summer tours, Medicinal tours, Religious tours, Bicycle tours, Sports tours, Yoga tours, and Honeymoon tours.